It wasn't a vintage Arsenal performance by any stretch of the imagination, but our main offensive cogs did the business when presented with some lucky chances in the Watford penalty area. Let's be honest, though - three points are welcome wherever they appear, however they choose to get there. The starting XI were "as you were" from recent weeks, with the exception of Per Mertesacker drawing back into central defense in favor of the ailing Gabriel. The consistency didn't immediately help though, as a game Watford squad packed their penalty area and looked to counter with long balls over the top. The Hornets boasted one of the stronger defenses in the league coming into this one, and they were especially aided and abetted by an atrocious refereeing performance by Mike Jones. Particularly, I would love hear the explanation for how Odion Ighalo got away with what was essentially a clothesline to Laurent Koscielny. It was one of those "accidentally-on-purpose" deals, especially when you note how he looked back to measure him up a second or two beforehand. That's not to say that the home side were completely out it, though. Troy Deeney stung Petr Cech's palms with a long-range shot, and Igahlo would have been in alone on our keeper had Deeney been able to come up with any kind of proper square-ball. Our guys carved out a few chances of their own though, the best of the lot probably a volley from Aaron Ramsey off a gorgeous cross from Alexis Sanchez. It wasn't an easy one to convert though, and the Welshman duly hammered it over the bar. Other than that, their attacks were mostly dealt with by another boss-like performance from Koscielny, as well as some Neuer-esque goalkeeping from Cech. As the second half wore on, the Gunners changed gears and started to target Watford left back Allan Nyom. Hector Bellerin in particular tormented him throughout the second period, to the extent that they eventually had to sub him off. The goal was always coming, and it could have happened one of two ways on the play where we got it. Mesut Ozil was hacked down in the area, but before the spot-kick could be called, Alexis was there to lash one off the post and in. Perhaps Watford's heads dropped there a bit, because the game was done and dusted a few minutes later. As the header indicates, we had some bounces go our way. This time, a shot from Ramsey in the penalty area pinballed out to the right, directly into the path of a wide-open Ozil. 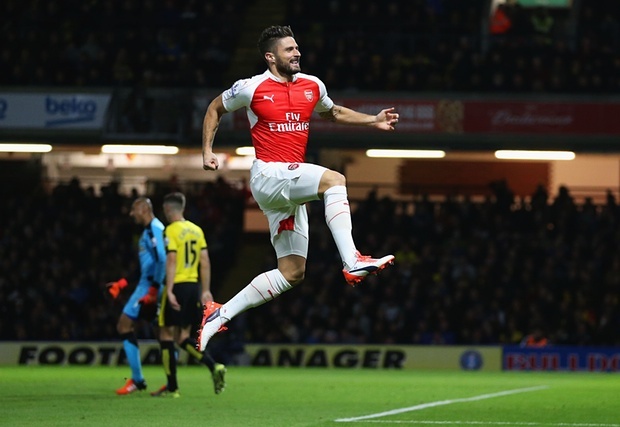 A simple cut-back to the substitute Olivier Giroud was imperiously swept in by the Frenchman. Game over. Still, there was on nice moment to come, as the Welshman went some way towards answering his critics by ending his own scoreless streak. The goal was all Bellerin though, utilizing pace and power to storm down the right and shrug off his marker with arrogant ease. He cut it in to Ramsey, who managed to sneak one past Gomes and in. It wasn't pretty, but hopefully it will help our man's confidence. If nothing else, we got a decent win against a game opponent, all while not necessarily clicking on all cylinders. We'll learn a lot about this team in midweek though, as the specter of Bayern Munich looms in the distance. I can't say I'm massively confident going in, but at least we're doing so on the back of a win. Man of the Match: You could easily give it to Alexis or Ozil or even Coquelin, but for me Hector Bellerin takes it with a brilliant overall performance.